I already have a Camino coincidence story. To start, I confess to lying about my packing list. I was carrying a huge additional item – a second pair of boots that weighed about 800 g.
Two days before my departure for Spain; I was browsing through MEC (a mistake) and admired a new pair of the boots which I got there almost 2 years ago and planned to use on my camino. I noticed that the soles were stiffer than my worn ones and decided that my feet needed that support. I bought a new pair of identical boots and figured I could break them in during the 4 days before starting the walk. However I took my old ones to Spain as well, for peace of mind until the new ones were perfect. Then I would discard them.. But the day before starting, the new boots still weren’t quite as comfy as the old ones, and I had neither the space in my pack or the wish to carry both. I wished I hadn’t bought the new ones. Postage home was going to be half the cost of the shoes. What to do?! Cut to the albergue and arriving pilgrims. 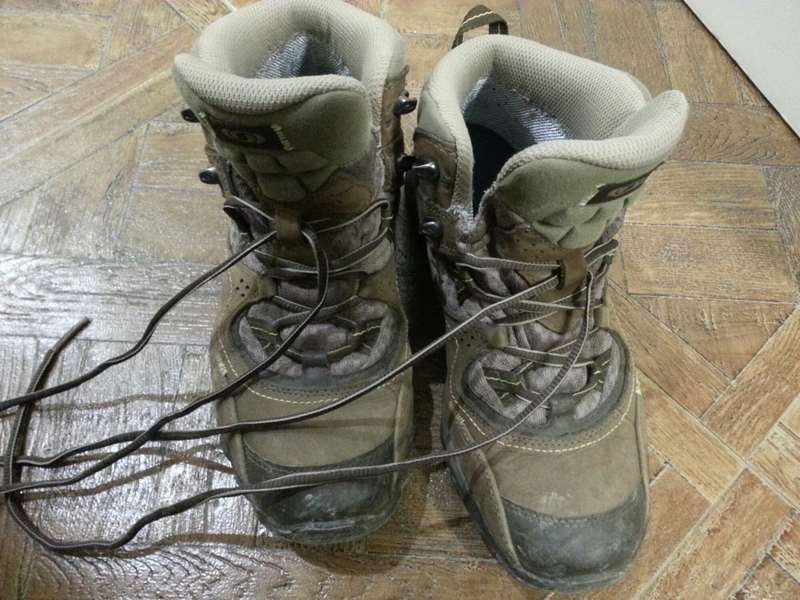 One young woman had managed to forget her hiking boots at home and had bought some cheapo ones in a town en route. The boots were men’s, two sizes too big, but the only ones available so she was going to have to walk in them. Somehow I had mentioned my own boot quandary and she asked what size they were. 7.5. BINGO. Tried them on and they were perfect so I sold the new ones to her! We were both happy. As they say, the Camino will provide. Wow! Proper/ comfortable footwear might be the most important item on an undertaking such as yours. With a happy resolution, and sooner than expected, too! I was not planning to carry the extra pair far! I guess ” these boots are made for walkin’ ” Just had to comment !!!!!!!!!!!!!!! !